I founded this humble blog for the purpose of sharing picture book teaching ideas with my fellow teachers. I frankly wasn't able to find anything like it on the Internet. Since that time, many teachers have emailed me to say how much they appreciate the recommendations and resources found here. Many, however, are hungry for more, and invariably ask, "Where can I find other sites like yours?" To advance the cause of teaching with picture books, I reached out to some of the extremely knowledgeable and talented educators who, like me, not only review children's books, but also provide their readers with teaching ideas and additional resources. I absolutely encourage you to visit their sites, become followers, and share their resources with your colleagues. In addition, if you know of a fantastic site that I missed (especially if it's yours!) please let me know and I'll be sure to include you here. Audience: Teachers, Parents, Homeschoolers, Anyone Who Loves to Read, Write or Create and Wants to Share that with Kids. Teachers and parents from all over the world visit The Book Chook to find tips on encouraging kids to read, write and communicate, reviews, letters asking for The Book Chook's advice, articles about using technology to motivate kids' learning, and links to games, activities and online fun. Susan Stephenson is the face behind The Book Chook, where she shares her passion for children's literacy, literature and learning. Susan taught Kindergarten to Year 6 in Australian primary schools, drama outside school to kids and young teens, and ESL in China. Currently, as well as pretending to be a chicken on her blog, she writes stories for children, and edits the free magazine for parents, Literacy Lava. It's published four times a year, and available as a downloadable free pdf. Each issue is erupting with practical ideas and strategies to involve children in reading, writing and communicating with creativity. Contributors come from all over the world, but each shares a passion for children's literacy. I am an elementary Head Start teacher by day and a reader during any/all free time. Being a teacher I am always looking for children's books to read and use in the classroom. This blog provides readers with books (mainly picture books for children between the ages of 3-10) and if possible, lesson plans and reading activities to match. Feel free to steal the ideas for your own classroom, reading group, library or children! 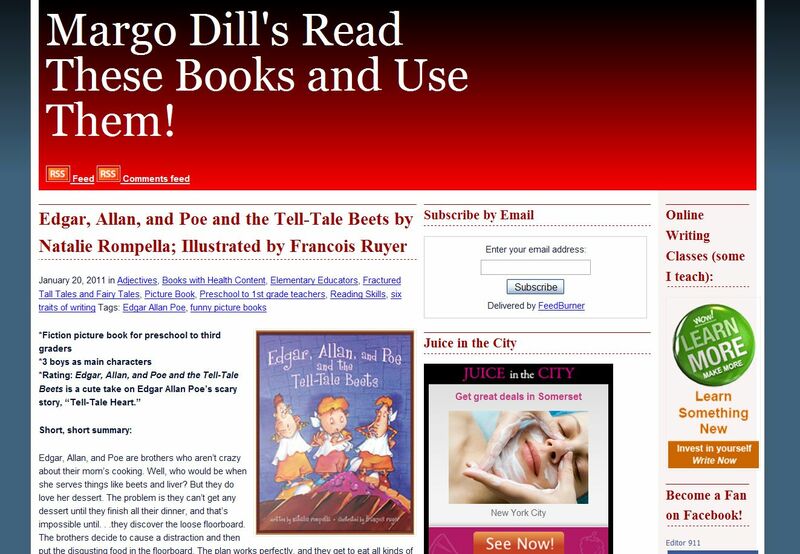 Margo L. Dill is a freelance writer, editor, and teacher, living in Mahomet, Illinois. Her work has appeared in publications such as Grit, Pockets, True Love, Fun for Kidz, Missouri Life, ByLine Magazine, and The Chicago Tribune. She is a columnist, instructor, and contributing editor for WOW! Women On Writing. She is assistant editor for the Sunday Books page in The News-Gazette. Her first book, Finding My Place, a middle-grade historical novel, will be published by White Mane Kids. She owns her own copy editing business, Editor 911, and is an instructor for the Children’s Writers’ Coaching Club and the WOW! Women On Writing Classroom. This blog has gone through many changes in the last two and a half years due to how my life has changed, too! But currently, I feature a book twice a week (picture book, middle-grade, or YA) and provide three activities or discussion points to go with the book. Every once in a while, I host an author, interview him or her, and have a book giveaway. 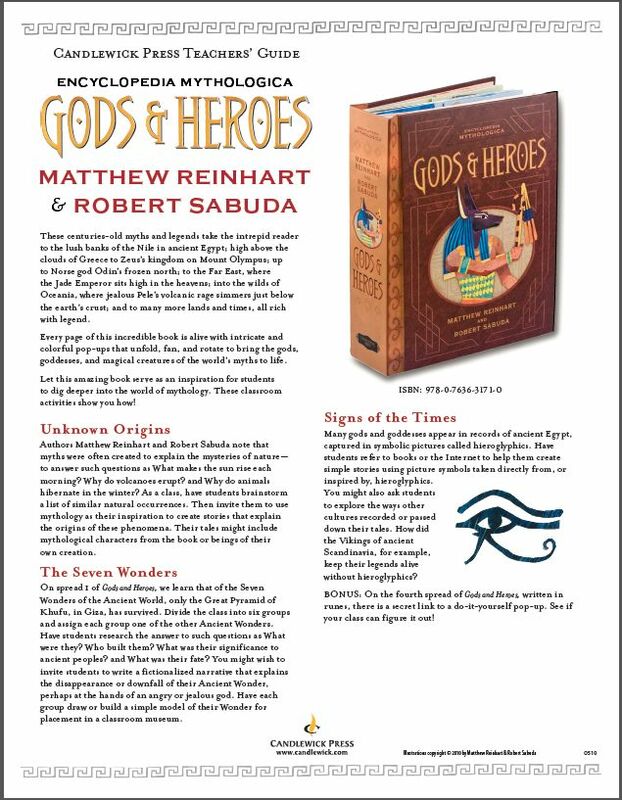 I will also post information for teachers/homeschoolers if I find something really interesting that I think people need to know about to reach children or teach in schools. In my archives, you'll find posts about books that help children/women around the world, more activities to go with books, lesson plans for preschool to senior high, six plus one traits of writing activities, product reviews, posts about being a mom educator, and more. When she's not writing, she loves spending time with her husband, stepson, daughter, and two dogs—Chester, a boxer, and Hush Puppy, a basset hound. Use the category list on the sidebar to find authors you like, books appropriate for your children or students, and even books to fit certain categories like books about health. Click on the tab at the top of Margo’s site to check out some ideas and resources for helping children and teens around the world. Jeff Barger’s goal with NC Teacher Stuff is to provide resources that will help teachers in the classroom. While his reviews are mainly picture books, he also reviews iTouch apps and the occasional novel as well. Jeff is a kindergarten teacher in North Carolina. 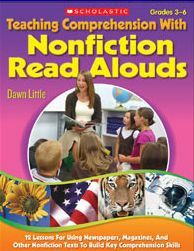 Dawn Little is the author of Teaching Comprehension with Nonfiction Read Alouds: 12 Lessons for Using Newspapers, Magazines, and other Nonfiction Texts to Build Key Comprehension Skills (preview it here; buy it from her blog!). 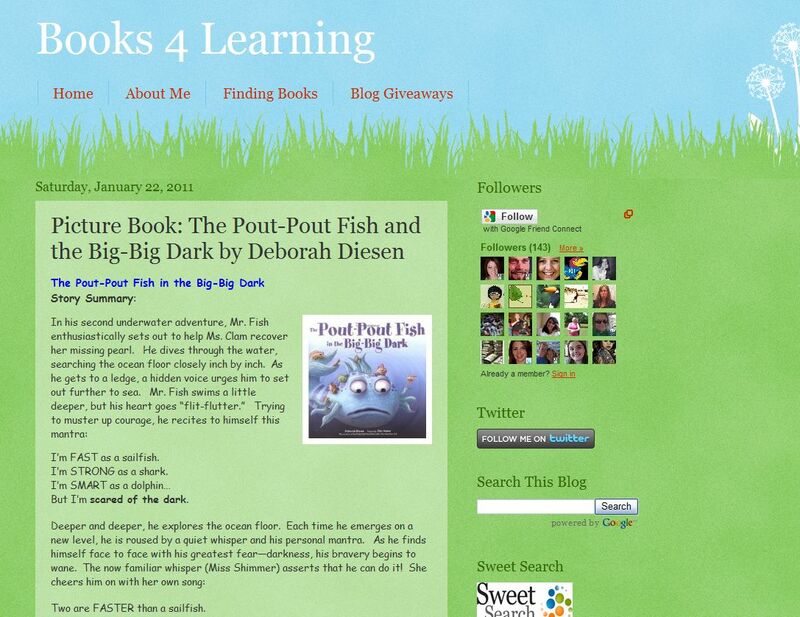 Dawn's Teaching with Picture Books provides educators, parents, and homeschoolers with picture book models to guide their teaching of reading comprehension strategies and the six traits of writing. Dawn is a mother of two, former classroom teacher, consultant, and author. She created a literacy consulting company, Links to Literacy, in 2009. Links to Literacy provides parent workshops, educator workshops, and literacy enrichment classes for children. 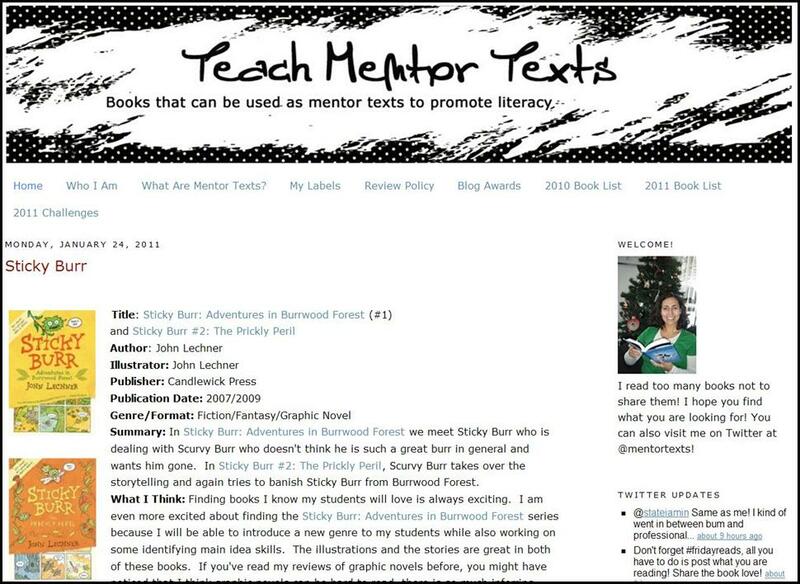 She also blogs at Literacy Toolbox. Shirley Duke is a former science teacher turned children's writer. She holds a bachelor's degree in science and a master's degree in education. She's always loved reading and science and her blog lets her combine them both. SimplyScience combines the pleasure of reading books with a short, simple science activity that can be used to extend an idea from the book. Shirley started blogging two years ago and found she liked it. Her first book was No Bows!, a picture book. She's written Unthinkable, a YA horror named a Quick Pick for Reluctant Readers, and two science books. 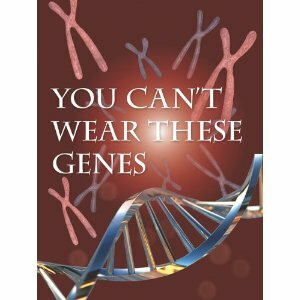 Her science books are Infections, Infestations, and Diseases and You Can't Wear These Genes. 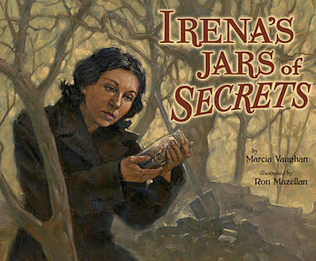 She guest blogs for the NOVA site "Secret Life of Scientists." All the professional books I have read and all the research shows that the kids who read more are the kids who do better on reading tests. I got to thinking about my life as a reader. I want all my students to grow up and be lifelong readers just like me...well, do I read worksheets? Do I fill out reading logs after I finish a chapter or 20 minutes of reading? Do I read a book that is way to hard for me or that doesn't interest me at all? Of course not. I decided that matching my students with authentic, mentor texts was critical to helping them improve as readers. 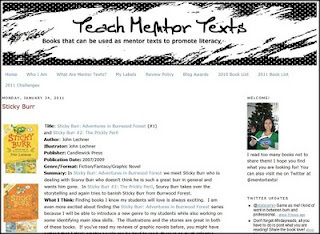 I started blogging at Teach Mentor Texts to share the great mentor texts I come across. My proudest professional achievement has been to achieve National Board certification this year in early/middle childhood literacy. I am so glad I went through the process because I learned so much about myself as a teacher and further developed my philosophy of teaching. I am currently in my 9th year of teaching. I am a hearing itinerant teacher; I work with K-8 students who hard deaf and hard of hearing in various schools in my district. Outside of school I am a mom to two awesome boys (ages 3 1/2 and 6 months) and wife to a sports-loving hubby. Keith Schoch is a classroom teacher of over 20 years presently teaching Sixth Grade Reading/Language Arts in Bedminster, NJ. He started his Teach with Picture Books in an attempt to share his love of using picture books in the upper elementary classroom. Since that time, he's started two other blogs: How to Teach a Novel and Teaching that Sticks. 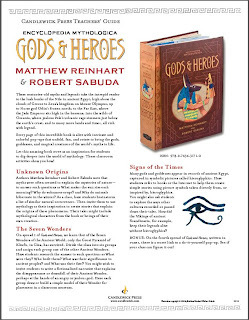 He leads occasional workshops and inservices, and also writes original curriculum and teaching guides, such as his recent teaching guide for Encyclopedia Mythologica: Gods and Heroes (Candlewick Press). Teach with Picture Books is aimed at teachers of grades 3 and up who want to incoporate picture books in their daily instruction. In the majority of his posts, Keith collects a number of recommended titles sharing similar themes, topics, or traits, and then provides teaching ideas, related resources, and links to interactive activities. 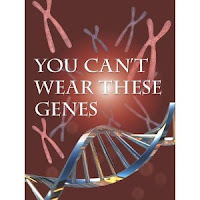 I'm often asked my favorite picture book. That's like asking a parent to choose a favorite child. One is there when you need support, another is there to lend a strong hand, another is there to help you with a good cry, and another is there to provide wise counsel. Picture books can serve so many purposes, and pure enjoyment is perhaps the greatest of these. The purpose of Books4Learning is to highlight quality children's literature as a resource for parents and educators (homeschool or classroom). Blog author Chelanne often offer ideas and links to prompt learning opportunities - literary, interpersonal, and cross-curriculum. Some posts focus on the best books on a specific subject or on a tween/young adult novel which Chelanna has recently read. I am a parent who currently homeschools. I have two education/English related degrees. I have worked as an elementary classroom teacher and a college English instructor. I LOVE reading books, especially picture books. I do library runs (to three different systems) at least twice a week. I love researching and finding everything available on a topic. I started blogging to share my favorites with others. Thanks to all these dedicated bloggers for taking time to share about themselves and their work! Got a question for these experts? Looking for a book or topic you'd like to explore? Have another site to share? Leave a comment below. I'm thrilled to find these great resources, Keith, most of which are new to me. Thanks for including me in such a stellar line-up! I'm pleased to spread the word! So many teachers, homeschoolers, and tutors aren't aware (yet!) that these resources exist. What a fantastic round-up of resources! I reviewed a couple of picture books this week - I tend to switch back and forth between picture books and YA, dizzying, I know! Katie does not only talk about using picture books to teach, but her posts on that topic are thorough and very powerful. I've truly learned a lot from her! Silvana: I agree that Creative Literacy is a terrific site. It was definitely in the running! I finally decided to choose sites that were more focused on the picture book topic, all the time; I found quite a few that had a picture book focus one day of the week, for example. Thanks for mentioning this site! Thanks for mentioning my site. :) It is so refreshing to know all these people that are out here blogging about books and how to use them. Keep up the good work. Thank you so much for including me! This post looks great. Second the thought for keeping up the good work. I'm so glad I found your site. I'm a children's book author and also the director of the National Writing for Children Center, a showcase for children's book authors and illustrators. Every month we show parents and educators how to use picture books (and other children's books) as part of their teaching tools. Our site features articles on using picture books to teach prediction, cause and effect, main idea, and all sorts of other basic concepts. I noticed that some of the books you mention on your site have been featured at our site as well! Thanks for sharing your site with us. I actually recall coming across it some time ago, and you've got some excellent resources there. I'm sure there will be a follow-up to this post, and I'll definitely point folks your way. At Delightful Children's Books, you can search for booklists by child's age and by subject matter (e.g. art, backyard wildlife, dance, snow, other countries, friendship). Thank you for including my SimplyScience blog here. This is a great roundup of helpful blogs and I enjoyed seeing ones I didn't yet know. My pleasure, Shirley! Wish every content area had a picture book proponent like you! Susan is only pretending to be a chicken? Drat, my bubble is burst. Seriously, Keith ... this is a GREAT lineup. I would also add Franki Sibberson/Mary Lee Hahn's blog A Year of Reading. 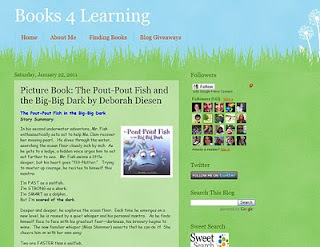 Try out aneducationinbooks.wordpress.com for must-read books for kids. About two-thirds of the posts are about picture books and there are ideas and brief teaching points on most. I checked it out and it's a pretty straightforward yes useful site with some nice picture book selections. 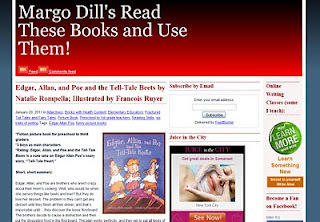 Terry: Thanks for reminding me about A Year of Reading (readingyear.blogspot.com; I saw it a few months ago and enjoyed reading through the posts. It does give some nice reviews as well as teaching tips for selected books. Great post! Thank you for including us. Thank you so much Keith for putting together this awesome list of picture book resources! I'm honored to be part! Sunya, glad to be of help. As a fellow secondary teacher, I agree!